Your family will love this sweet take on an old favorite! 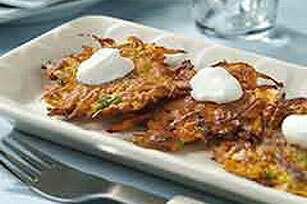 These latkes are made with grated sweet potatoes and ground cinnamon, and topped with sour cream. Grate potatoes using large holes of box grater; place in center of large clean kitchen towel. Bring up ends of towel and twist together to form pouch. Hold pouch over sink, then squeeze to remove as much moisture from potatoes as possible. Empty potatoes into large bowl. Add onions, eggs, flour, cinnamon and pepper; mix well. Heat oil in medium nonstick skillet on medium-high heat. For each latke, carefully drop 1 Tbsp. potato mixture into skillet, cooking 2 or 3 latkes at a time. Immediately spread each mound into thin circle with back of spoon. Cook 3 to 4 min. on each side or until golden brown on both sides. Remove latkes from skillet; drain on paper towels. Repeat with remaining potato mixture. Substitute matzo meal for the flour. Latkes can be made ahead. Refrigerate until ready to serve. To reheat, place in shallow pan and bake in 350°F oven 10 min. or until heated through. Recipe can be easily doubled for a larger crowd. Prepare as directed, doubling all ingredients. Makes 16 servings.